Get ready to party it up in Las Vegas! SUPER LEAGUE SEASON 5 has officially begun and over a thousand players are participating. League teams all over North America are competing to be the best in their division. League Champions will be determined at FIESTA held in Las Vegas from May 11 - May 14, 2017. Come join us at Westgate Resort and Casino Las Vegas for an unforgettable experience. Remember, hotel rooms are limited. Reserve your hotel rooms today at a special rate exclusive for DARTSLIVE players. Don't miss out on all the fun and big prize money! 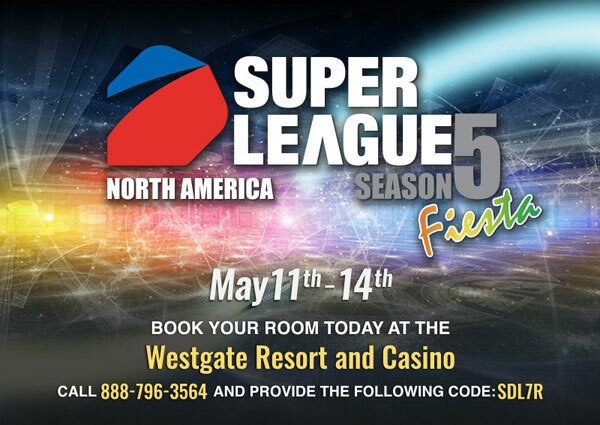 For more information, please visit the SUPER LEAGUE SEASON 5 FIESTA official website below.